The education programs at Wilson are designed to develop professional competence through integration of theory, observation, practice and clinical experience. 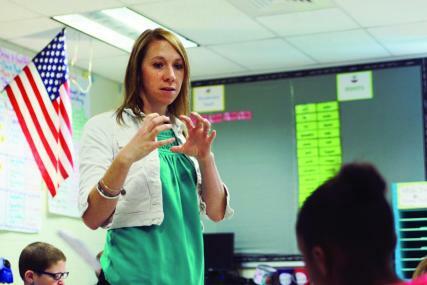 In preparing successful candidates for Pennsylvania Pre-K-12 certification, our Department of Teacher Education faculty not only builds close communities of students through collaborative learning in small classes but also builds partnerships with school communities through collegial dialogue, staff development opportunities, and interactive field experiences. We provide thorough, individualized advising to accommodate the diverse needs of students from the undergraduate program (both bachelor's and associate's degrees) and the Teacher Intern Program. The Teacher Education program serves as a resource for both the college community and the community at large to model innovative educational practices that result in the highest standards of teaching. All Education majors and certification programs choose courses across a wide range of disciplines that provide the broad knowledge base required for teaching in Pennsylvania public or private schools. Pennsylvania Department of Education, in their annual Proposed Teacher Shortage report, indentifed the following subject areas to have the most severe teacher shortages in PA. The ten subject areas are: English as a Second Language, Fine and Performing Arts, Foreign Language PK-12, Hearing Impaired, Sciences 7-12, Mathematics 7-12, Special Education PK-12, Speech & Language Impaired, Visually Impaired and Vocational Education. Wilson College offers certification in the bold-faced areas. Come visit Wilson today! If you hold a bachelor's or master's degree from another college or university please visit our Teacher Certification Pathways page. These programs are specifically designed to accelerate the academic process while getting you the core classes that you need toward the teaching certification. Already have PA teaching certification and want a master degree, visit our Graduate Education Programs. "From my first visit to the admissions office to finally walking across the platform to receive my diploma, Wilson College was the perfect choice for me to earn my Bachelor of Arts in Education because of its affordability, level of preparation for today's classroom, and incredibly supportive team of professors and educators. The professors and adjuncts in the education department are continually seeking ways to keep their curriculum and instruction engaging and relevant for the ever changing classroom environment. I would highly recommend Wilson College as a great place to build relationships and fulfill that lifelong dream of being a teacher." "Being in the Adult Degree Program, I have needed extra guidance from the Education Department throughout my years at Wilson College. An already demanding schedule meant that I would need to find courses that fit my limited availability. The Education Department was consistently helpful in guiding me along my journey in becoming an educator. Wilson easily became my home away from home and the Education Department played no small part in making that happen. "My experience in Wilson's education program has been very rewarding. This program has prepared and inspired me to make a difference in our world through education."